Industrial Brush Design Latest News | Industrial Brush Company, Inc.
With a company history dating back to 1946, you can count on Industrial Brush Company to provide you with top of the line brushes that go above and beyond your expectations. Not only will our brushes go beyond your expectations, they will fit into your application seamlessly. Although the actual mechanics of manufacturing brushes hasn’t changed all that much over the past few years, Industrial Brush Company has done our best to stay at the top of our industry by providing high quality tufted and finest brushes out there. And while the manufacturing process hasn’t changed all that much, these brushes are still a necessary part of a number of different precision-brushing applications. Our wood finishing brushes are some of the best out there as they are balanced at your operating speeds in order to insure less vibration and chatter free performance. And we offer a number of core options as well as bristle configurations. Our patented bristle bonding system provides a bristle pattern that chemically bonds groups of bristles in staggered pattern to our metal core. The tufted wiping brush is one that yields a long life and is perfectly compatible with the majority of stains and solvents that are used for brush cleaning. 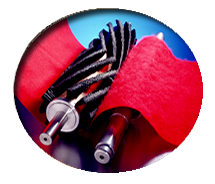 Industrial Brush Company provides a number of complete lines of abrasive nylon sanding brushes for a number of different flat line finishing systems that cover a wide range of domestic and foreign systems. On top of providing premium products, Industrial Brush Company offers top of the line testing facilities in order to ensure that you are getting the proper bristle length, pattern, grit and brush speed that your application requires. If you send us some samples we will test your product in our lab, which means that this is the most cost effective means of making sure that your brushes are at peak performance. We’re looking forward to the challenge, contact us today at sales@indbrush.com or give us a call at (800) 241-9860! If you’re searching for a brush for a new application or you are just looking to replace a brush on a machine that is already a part of your process. You have found the right company, Industrial Brush Company offers a number of different solutions for a wide range of applications. With experience dating back to 1964, Industrial Brush Company has the experience you can count on while maintaining cutting edge technology to ensure that we stay at the top of the industry when it comes to quality and innovation. In fact, we are proud to say that we carry some of the best metal finishing brushes in the industry! Our Silicon Carbide Industrial brushes are designed with the specific purpose of maximizing cleaning and oxide removal from metal finishers and circuit board manufacturers. Because of this they are utilized in a wide range of applications from tin lead solder coating and copper plating to deburring and surface preparation. The abrasive nylon known as silicon carbide, is basically extruded nylon that is mixed with stones. The actual diameter of the stone is how to differentiate between brushes and determining the grit that the brush is identified with. The brushes that we carry here at Industrial Brush Company range from two inch diameter all the way up to sixteen inch diameter and can vary in length from 2” to 195” depending on your needs and requirements. Contact Industrial Brush Company today if you require one of the finest metal finishing brushes in the business. No matter your application, we have the brush for you. We understand that quality is an important part of our business, which is why we put such a high focus on it. However, this doesn’t mean that our deliveries take longer than others, in fact it is our philosophy to keep our deliveries as short as possible, even though our customers tend to make custom made brush purchase in order to ensure that the brush fits their application. Dating all the way back to 1946, the Industrial Brush Company has been on the cutting edge of brush technology and has worked hard to push our products to the next level of innovation. This is why we are considered to be a leader in our industry and why our clients return to use time and time again for high quality products that meet their needs. While things have changed over the years and how we do things has changed as technology has evolved, the way we do things hasn’t. That’s because we do things the right way, we take the time to look at new and interesting problems from multiple perspectives in order to find a solution that fits the needs of our customers. This is true for every product line that comes from Industrial Brush Company, including our glass washing brushes. We are proud to say that we offer a complete line of glass washing brushes that are applicable to a number of different applications both domestic and foreign. Each and every brush that leaves our company has been designed and manufactured in a way that will provide you with superior washing performance along with an extended brush life. We have a number of bristle pattern options depending on your needs, from fine bristle nylon to tufted bristle nylon and everything in between you can be sure to find what you need here at Industrial Brush Company. Our finest bristle pattern utilizes 6:12 nylon that is chemically bonded to a metal core which provides the brush the most uniform and softest contact with your glass. While the tufted bristle pattern provides mores scrubbing action and is more aggressive. On top of providing these different solutions, we also are proud to say that we offer re-bristle and re-trim services in order to keep your brushes operating at peak performance. If you have any questions on our glass washing brushes or any of our other products reach out today and we would be happy to work with you in order to find a solution that meets your needs. Ever since 1946, Industrial Brush Company has been pushing the boundary within the brush industry. We have taken an industry that has had very little change in the past 50 years and have put the time and effort into creating some of the most cutting edge brush designs that function in a way that provide our customs with superior efficiency and outstanding results. In order to ensure that Industrial Brush Company’s brush designs will function properly we’re proud to say that we utilize an in-house testing facility where we are able to fully test out our ideas before delivery. This testing facility is a space where we are able to continue pushing the boundaries of the brush industry in a safe way. We love a challenge here at Industrial Brush Company so much so that we encourage you to reach out with your most complicated need through a request form and we will do our best to provide you with the best possible solution. We are able to run both conveyor and web type products and our test machine is built in a way where we can replicate your applications needs and requirements. We have found that customers usually will send us both unfinished and finished goods in order to find the best fit. This type of interaction is what we live for, we encourage every customer to be involved with our process as collaboration is the best way to evolve a process into some more efficient and better suited for specific needs. This testing facility in addition to other areas of our business are part of the reason why people keep coming back to Industrial Brush Company for all of their brush needs. We have worked with a wide variety of applications so we invite you to explore our website further and see if we have already worked with an application similar to yours and have a brush that may fit your needs. If you do not find anything that fits your needs exactly, reach out to us and we will work with you to find a solution. The Industrial Brush Company started in 1964 and has grown from a small family operated business into a successful company that is still family owned and in its third generation. We are proud to serve a variety of industries with our brushes thanks to a versatile brush design. One of the markets that we provide high quality solutions for happens to be the pharmaceutical and food processing industry where our super clean brush construction more than satisfies the high standards that are required within this industry. Thousands of industrial brushes are in use within the pharmaceutical industry in order to properly move, level and meter different pills. In order to function in this type of environment the pills must meet a certain hardness and specific shape requirement. Here at Industrial Brush Company we have been providing high quality brushes to many manufacturing industries for over 50 years, but because of our extensive knowledge of brushes and brush design we are able to serve delicate industries such as the food and pharmaceutical industry. We encourage you to take a look at our bakery brush and pharmaceutical brushes to get an idea of the quality that we provide to our clients. Our finest bristle patterns are utilizes and they use a phenolic adhesive which forms a solid, non-porous base that is able to reject foreign contaminates which means that any buildup at the base of the bristles is stopped before it begins which is an amazing feature in the food industry. For more information on our food and pharmaceutical brushes poke around our website some more or contact us today in order to see if we can provide a unique solution for you. Industrial Brush Company has been committed to quality and service since 1946, we look forward to hearing from you! Here at Industrial Brush Company we pride ourselves on offering a wide range of brush products for a number of applications and industries. We have been providing high quality brush products for almost 70 years and we continue this tradition of excellence throughout our day to day operations. Our headquarters in Fairfield, New Jersey contains state-of-the-art equipment that allows us to meet the needs of our customer’s quality standards while also keeping our deliveries as short as possible, even if our customers are purchasing a custom made brush that is built specifically to fit their unique application. Working with our customers is something that we firmly believe in and have been practicing since we first opened our doors in 1964; we remain committed to our customers because we know that without them we wouldn’t be in business. This commit to quality and intentional relationships is why some of our customers have been buying from us since our first generation. No matter your industry, we are willing and able to provide you with a solution that fits your needs. Some of our major markets include textile printing and finishing, glass washing, paper manufacturing, wood finishing, food processing & pharmaceuticals among many others. We design and manufacture brushes that are custom built for these applications, so we encourage you to tour our application pages. If you are not sure of the right brush for you, contact us and we will listen to your application in order to suggest a brush that fits your application or we can custom manufacture the right brush solution for you. Our in-house testing facilities are a great way to ensure that the brush we design for you is something that will add value to your application. For more information on our company please visit our company profile page or fill out a request form to find the right brush for your application. One of the things that set our brushes apart from our competition is the time and commitment we put into each and every brush design we craft. And while we are well known for our Fineset and Tufted rotary cylinder brushes, we also offer high quality strip brushes for those applications where a Fineset or Tufted brush might not be aggressive enough. Fineset brushes tend to meet a wide range of applications due to the fact that they offer uniform cleaning along with an ability to control both gentle and aggressive applications with just about any brush surface. Tufted brushes can cover just about any type of application, however if the application requires an aggressive wire bristle strip brushes are the way to go. Whatever your needs may be, Industrial Brush Company is here to provide the right brush for your application. Brush applications can be broken down into six different categories, Applying, Finishing, Polishing, Removing, Scrubbing, and Spreading. With each function comes a different type of brush winding and bristle arrangement along with varied bristle density. Our Brush Design page provides an over simplified table to use as a starting reference to understand what you may need based on the function of your application. On top of these options there also is the choice of which type of core design is best for you. We manufacture our core designs to fit our customers’ needs and unique requirements whether you’re looking for solid shaft design or internal bearing design, Industrial Brush Company is able to provide you with the perfect brush solution for your application. For the past 70 years, Industrial Brush Company has been working hard to provide our customers with high quality products through the use of innovation and state of the art technology in our Fairfield, New Jersey facility. We have built our business through first building real relationships with our customer’s by getting to know their applications and process in order to better serve them with the right brushes for their needs. So if you are unsure of what type of brush is right for your application, feel free to contact us or fill out a request form in order to determine the right brush design for you.